Join us Saturday, July 13th from 1:00 to 6:00 p.m. as we “Raise the Roof” at Historic Christ Church & Museum's 6th-Annual Craft Beer Fest. Enjoy 12 Craft Beers, delicious BBQ (or vegetarian fare), homemade ice cream, and live music by Good Shot Judy and Bobby "Blackhat" Walters. Your ticket includes a souvenir glass & five craft beer tasting tickets, one serving of BBQ (or veggie fare) with fixings from Willaby’s, homemade ice cream from Short Lane in Gloucester, and awesome music all at one of Virginia’s most historic sites. You may also use your tasting tickets for wines from the Dog and Oyster Vineyard. Additional beverage and meal tickets may be purchased at the event. Soft drinks & water provided. Please bring your photo ID and your own lawn chairs or blankets. No pets or coolers. Rain or Shine Event. 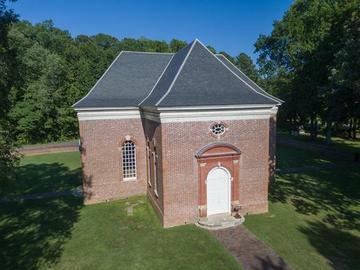 Funds benefit preservation of Historic Christ Church (1735), a National Historic Landmark.